We finished setting up the irrigation system on the new field blocks this week. Next week we'll start transplanting the last wave of the cool weather crops and the first of the warm weather crops. We also direct seeded our last planting of carrots until fall. Peaches are sizing up nicely! We're hoping to start thinning fruit this week in order to allow the peaches to size up. Our male medjool date palms have begun sending out there pollen flowers. We use ladders to climb up into the palms and remove these flowers and set them on drying racks for about a week before extracting. This will help us get the maximum amount of viable pollen. Why do we hand pollinate our date palms, you ask? Medjool dates are wind pollinated not insect pollinated. Because we have a small grove of palms and because wind can be unpredictable, we pollinate all the female fruiting branches by hand. This gives us the best chance of getting consistent pollination and fruit set. Construction continues on the Barnone project. We finished clearing out the barn including removing our 15'x30' walk-in cooler. 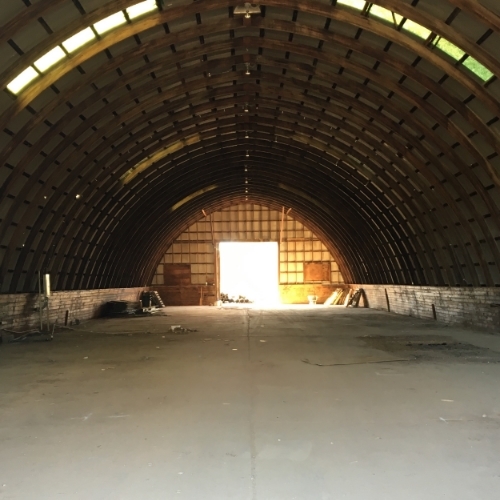 They can start the construction on the actual quonset hut. Spring/Summer CSA Week 4: easter egg radishes, pac choi asian cabbage, red leaf lettuce, sugar snap peas, baby wild arugula, broccoli, green bunching onions, rio red grapefruit. 1. Cut the grapefruit and oranges into thin circles, but not too thin as you don’t want them to break their shape. 2. With a knife, cut off the edges to remove the skin. You may decide to peel the fruits before slicing into circles but we found it easier to hold the fruit with the skin on to get the perfect thickness for the slices. 3. Peel and slice the carrot and begin arranging the citrus and the carrots onto your serving plate. You may decide to duplicate or triple this recipe depending on how many people you are serving. 4. Top the citrus and carrots with the red onion. 5. In a small bowl add in fresh lemon and lime juice, the honey, and the sea salt. Whisk together and then drizzle over the top of the citrus salad. 6. Sprinkle on the fresh tarragon and enjoy! Taste to see if you’d like more sea salt or more honey to make the salad suit your tastes! 7. Serve fresh and cold and store any leftovers in an airtight container for about 1 week.